It will always be a thrill for me to see one of my quilts on the cover of a magazine. I don’t know if other designers feel the same, but it’s very exciting for this one. Quiltmaker named the design “Can You Find It?” It’s bright and colorful and it’s easy to make. Funny thing: I was never the least bit interested in making I Spy quilts. And then I had a grand baby! Now I have two little guys, and the ideas for I Spy designs just won’t quit. 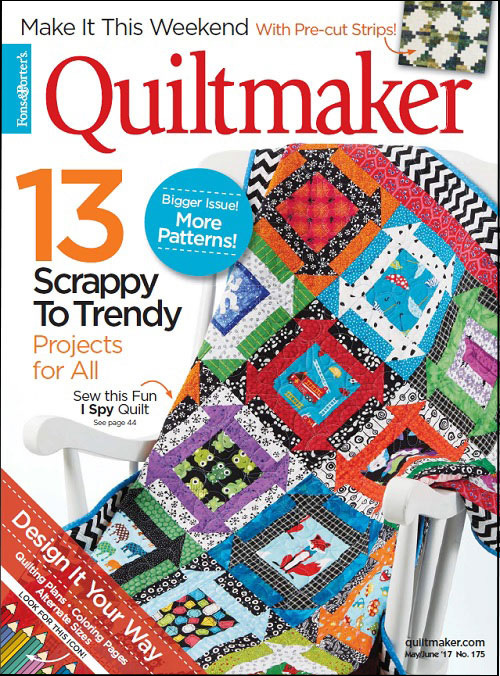 If you haven’t picked up a copy of Quiltmaker’ May/June issue, look for it on newsstands now. It’s also available from Quiltmaker in paper or electronic forms. It’s giveaway time on Stash Bandit! Becca bag designed by Joan Hawley; made by Diane Harris of Stash Bandit. Let’s have a giveaway to celebrate. It will include a copy of the issue, a stack of 4.5″ novelty patches (more than enough to make this quilt), a cute zippered Becca bag, some quilt magnets I make and other quilt happiness. I think you’ll like the package that arrives on your doorstep! There will be three winners. To enter, leave a comment before midnight Wednesday 4/26 telling me which part of quiltmaking confounds you. Your answers will become topics for my how-tos. Thanks for visiting Stash Bandit. I’m glad you’re here! The winners have been chosen and emailed: Diane, Helen and Carole. Thanks for being here and for participating! Chooseing the quilting design boggles me. Sometimes the quilt speaks to me and sometimes it doesn’t. What confounds me? The quilting of my quilts…I feel least confident about that . The most confounding part of quilting for me is basting the three layers together and having it come out smooth and even. I’ve been quilting just a few years. I like when an article explains what is good about the technique they are teaching. Example keeping the , straight of grain on the outside of a block with the bias cut or why people use polyester thread for machine quilting, it helps my learning process. I’m still working on good color and style of fabric , how to mix them, and how not to. I like your little churn dash, and have some fabric I inherited that I didn’t know what to do with. Now I do. Thank you! The most frustrating part of quilting for me is matching fabrics. I’ve been told “just use the color wheel,” or “use the color dots on the selvage.” Neither really helps me. I have a hard time visualizing how the finished quilt will look with the various fabric/colors/patterns. And making it scrappy just petrifies me! Too many choices. Thanks for doing a giveaway. I love your work! Which colors and shades of colors to use with each other. The actual quilting of the quilt! Even after 32 years of quilting I still have a tough time making my binding ends match neatly at the very last seam. Also how do you do binding completely by machine that looks good front and back of quilt? Figuring out a pieced backing is a struggle. Putting the fabric together. Match? Similar? Colorado family. Overwhelmed me. Basting prolongs my quilt finishing!! I spray baste-usually on the floor-and I hate it! The quilting!!! If I hand Quilt my hand ache, if I machine Quilt , my shoulders ache! Why does something I love so much hurt me this way!!!!! Machine quilting is one aspect of quilting I haven’t mastered. Thank you. I struggle with making the most of my limited quilting time. Figuring out how much backing I need then figuring out how to cut and sew to get it the right size. I think the most confounding part of quilting is finding the time to do it, I’m one of those folks with an invisible disease & it’s hard to get the energy & the free time at the same time. Once they align though, I’m good to go. I normally make small quilts but whenever I make larger quilts, I struggle to figure out the amt of fabric needed for the backing and how to cut and sew the backing together to fit the quilt top. I struggle with getting the quarter inch seam accurate and consistent whether it’s a 2 inch patch or a 10 inch patch! I am not confident in color and patten selection. My good friend that helped me make those choices is gone. I put off binding. It just always seems like such a big job–literally big. I feel like I’m wrestling with it. I love making scrappy quilts but when I put in everything but the kitchen sink I am not as happy with it as I want to be. I love seeing your scrappy quilts and can’t get the hang of putting it all in. Choosing fabrics – so I usually buy my quilting fabric already kitted. Makes life easier for me! Putting different fabrics colors together is what stumps me. I can LOVE all the fabric I’m putting into a quilt, but the finished product can leave me a bit disappointed. There can be a “surprise” at the end of piecing a quilt together that I don’t expect and don’t really like. Binding is my biggest challenge and the part I like the least. It’s always a surprise when it turns out well. I have gathered quite a fabric stash over the years. I’m confounded by how I’m going to use all (most?) of it in my lifetime…. And then, when new fabrics come out or I see a sale rack, I buy more fabric! That’s what confounds me! I continue to be confounded by marking quilting designs. My solution to that is to avoid marking whenever I can. Thanks for the giveaway opportunity! Thanks for the giveaway! I really enjoy your blog. For me as a beginner the actual quilting is stressing me out! I think that I am going to make a pile of pot holders to practice on. Joining the two ends of binding using a diagonal seam. Just can’t get it right! Trimming the edges of the quilt after the quilting is complete is my roadblock. How to bind angles other than 90 degrees. Deciding on how to quilt scraps quilts is always I challenge for me. Do I just do outline quilting or should I be trying to do more overall quilting. I have been quilting for over 25 years but still haven’t done a lot of machine quilting. I know practice is important but I can’t get motivated to just sit down and do it. I need to make something when I put the time in. I’m so glad you’ve started your own blog. I just found it and have to go back and catch up on all the entries. Picking out colors is the hardest thing for me!! I always have good intentions to try my best to do needle turn but feel like it’s a failure every time. The most confusing part for me is getting the top, batting and backing all smoothed out ready for quilting. Congratulations on your cover photo, how exciting!!! Have trouble picking out of my stash. Too much or wrong colors. 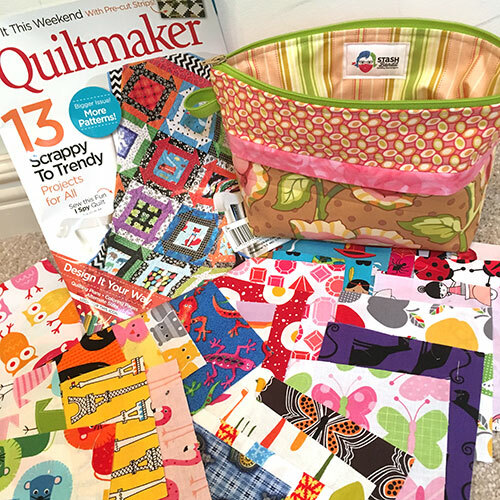 Congratulaions on your quilt appearing in Quiltmaker, exciting! I have troubles knowing what to mark my quilts with and managing big quilts under my sewing machine. Thanks for the opportunity of the give away. What confounds me? Too many amazing patterns and too many lovely fabrics to choose! Not really a bad problem to have, but I do struggle picking fabric. Paper piecing. I understand the theory, but just can’t make it work. The most confounding? Design, design, design…. Getting the tension right when I am machine quilting with domestic machine confounds me! Confounding…figuring out how to confidently free-motion quilt it myself. Thank you! The most counfounding part of quilting for me is figuring out how much fabric to get for borders, especially if I wish to make a quilt bigger. Free Motion Quilting. My sewing machine and I have reached an understanding- we rock at piecing, and we can straight-line stitch smaller projects nicely, but if a project needs FMQ, we’ll happily pay someone who does it well, while we move on to the next project. I’m still new to quilting, so anything beyond piecing the top together is confusing to me right now. My biggest hurdle when making a quilt is how to choose quilting designs that compliment my quilt. The most difficult thing for me is to figure out how to hand quilt a modern quilt. With traditional quilts it’s easy- quilt in the ditch and add something floofy in the (typically) smaller open spaces. Modern quilts are so much more open and I just can’t wrap my head around it. When I find a pattern I would love to make it is hard for me to pick out the fabric prints and colors that would best suit the pattern. I really struggle with quilting designs because I don’t feel confident with overall free motion patterns.